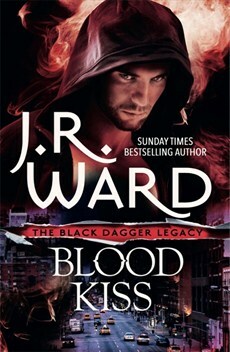 Blood Kiss is the first book in a new spin off series called the The Black Dagger Legacy. It covers two main stories. Firstly there are a set of new trainees in to be trained up by the Black Dagger Brotherhood to fight. Into that mix comes a number of hopefuls, among them Paradise, an aristocrat and Craeg - a commoner. Over sixty are taken into the mix the first night - how many will succeed fully into the training? They are thrown into the deep end and only the savvy and the fit will survive. This was one of my favourite parts of the book and certainly succeeded in hooking me in. Paradise is intent on success, she wants to be more than a pretty face, she wants her independence and show that she is able to fight. But of course she is not going to share all that she must do with her father, the chief advisor to the King - Wrath. Paradise is a spunky, intelligent, resilient character, she's like that as the book begins and by the time the book ends she grows even more so. Along with all that she has deep compassion that maybe at some point will be just what is needed. However her listening skills might need a slight adjustment. Craeg is also intelligent and resilient, his whole family has been wiped out and he is especially harbouring much anger at the way in which his father died. He and Paradise begin to fall for one another and soon their relationship is growing as their attraction for each other escalates. There is also much Butch and Marissa, along with Vishous. Marissa aids a young woman who arrives at her Safe Place badly beaten and on death's door. Butch is one to the fore in the training of the young trainees. The young woman's plight really rocks Marissa and then Butch and herself seem to be slightly off key. Their relationship hits a slight rocky patch, although their love is never in doubt. Marissa is wanting to be more, to have more - if Butch will only allow it. It is great to be back among the early Brotherhood, to witness the comings and goings, the fun and humour between Butch and V, and the way in which these big powerful, scary men are like putty in the hands of their woman, and really have hearts of gold. There is a good amount of action, and some mystery as to whom the badly beaten woman is, that plays out in a way that could never have been foreseen. Lovers of the BDB series will most likely enjoy this, if you're like me and read many but not all of that series, you'll find yourself slotting in just fine with it. I'm already looking forward to the next book and wondering who - perhaps Peyton, Paradise's cousin. She is also a trainee and now has a somewhat wounded psyche as a result of the happenings in this book. Really these big scary looking men are cuddly bears! Great review! I've only read one BDB book, but really enjoyed it. I've been eyeing this one! You'd probably be okay with it, even though you've only read the one BDB book. Want it, Want it, Want it. I loved Paradise in the last BDB book. Thanks!! Great review! I am looking forward to this book and will be glad to revisit with Butch and Vishous! I read the first book of the Brotherhood; it was pretty good, all that male testosterone. I will try out another since you're talking about this spin off series.